This year's Westminster dog show features two new breeds. NEW YORK — Dogs from affenpinschers to Yorkshire terriers are rounding the rings at the Westminster Kennel Club dog show. Breed judging began Monday at the illustrious show in New York. 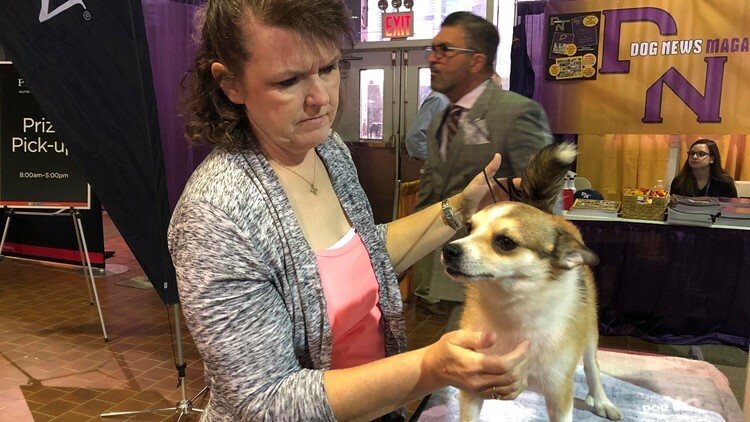 More than 2,800 dogs in 203 breeds and varieties are signed up to compete over two days, leading up to the televised Best in Show award Tuesday night. Monday's judging includes dogs in the herding, hound, non-sporting and toy groups. One closely-watched contestant is expected to be Whiskey, a whippet that notched big wins in shows televised on Thanksgiving Day and New Year's Day. This year's Westminster show features two new breeds, the grand basset griffon Vendeen and the Nederlandse kooikerhondje. The show also featured an agility championship Saturday and is holding an obedience competition Monday. Tracy Rousseau of Franktown, Colo., pets Eva, a Norwegian lundehund, as they wait to compete at the Westminster Kennel Club dog show in New York on Monday, Feb. 11, 2019.